I see that many conservative websites are all a gush over Judge Jeanine Pirro's latest on air Fox News rant calling for Paul Baby Faced Nelson Ryan’s resignation. I also see that President Trump himself made a tweet in support of it last night. Interesting. It was just about a year ago when Sarah Palin went on CNN and declared Paul Ryan's political career over for not backing Trump and she courageously backed Ryan's challenger, Paul Nehlen. 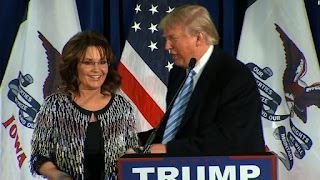 Perhaps Mr. Trump should have listened to Palin then, but instead he backed Ryan's re-election. Instead of tweeting out the ramblings of a failed Westchester County District Attorney who once wire tapped her husband's yacht and couldn't even put away Robert Durst—who is perhaps the dumbest serial killer on the planet -- Trump should be taking the prescient counsel of people like Palin. I've said this once I've said it thousand times: I do not understand why Trump decided to surround himself with a bunch of Judases and stiff arms loyalists like Palin. Perhaps one day we'll know why. It is not just me who is noticing the potential danger that President Trump is creeping towards. You see, you can be a Trump supporter who cares enough about him and the success of his presidency to warn him in the right direction. Or, you can be a supporter who believes the man can do absolutely no wrong and let him continue on the wrong direction. This morning, I read a comment at a blog that I have decided needs greater attention and exposure. It was made by a friend of this site who goes by the handle “1776er”. I do not know this man on a personal level and I am unaware of the qualifications that he possesses to make such a comment, but he could not be more dead on regarding the failed RyanCare bill, Palin and the current state of affairs in the Trump House. The commentary is long, but well worth the read. “Paul Ryan’s Health Care effort is increasingly looking like a setup. A hit job. Designed to fail. So, Ryan, castes it as a rough day at work. Wraps Trump all around the failure. Pushes the smell and stink of failure off himself and onto "The President and his staff, who worked very, very hard for this bill." Curiously, he never mentioned Pence. It is beginning to look like a UniParty #NeverTrump hit job. Recall we identified THE MONEY Trifecta.....core interests of the Ruling Elite....for whom Ryan stooges no doubt about it....Obamacare--Open Borders--TPP. 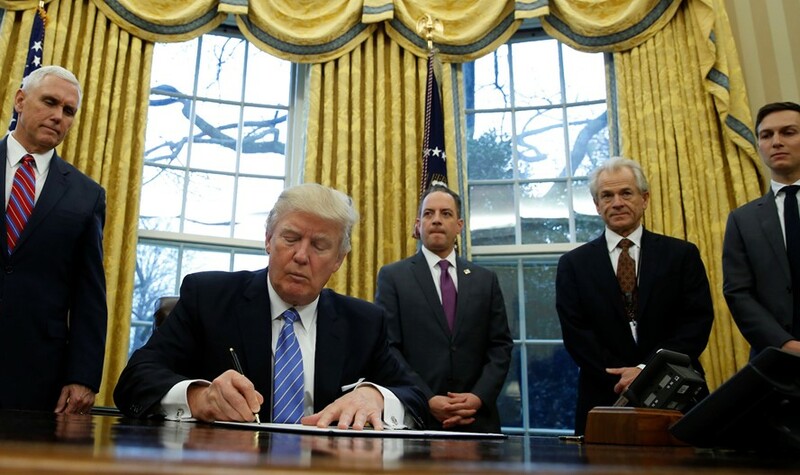 TPP is now history....we think. No thanks to Ryan or his Congressional allies who still want it. Thanks only to Trump's pen. Open Borders are still open. Stay tuned. Obamacare....the shifting cost of traditional worker benefits off the Corporate bottom line and Management incentives onto the taxpayer. Got to look beneath the surface of this beggars belief failure by Ryan. Nobody fails this badly. Nobody. If it happens it happens for a reason. I'm looking all the way back to what Sarah Palin warned Trump and us about last July 25. During the Convention chaos. When they couldn't destroy Trump and the Movement-Force-Strategy in the Primaries and all efforts to derail him failed at the Convention The Seal Island Never Trumpers turned to Plan B.
Sarah Palin labeled Plan B "Shifting and Sifting". See her now chilling prophecy and assessment of the State of Play for Donald Trump. "Conveniently, oppressors of this nationalist revolution found a way to save face. The obvious wall-writing told them they'd lose money and influence if they continued fighting AGAINST the majority, so the donor class scattered from their polarizing candidate when Ted Cruz's suicide vest detonated at the GOP convention. The collateral damage is too much for them to survive; it's shaking hell right out of their piggy banks. It wasn't cool then to wage war against the permanent political class that's essentially throwing in for Hillary Clinton, but after the Cruz implosion they have an excuse to come around. They'll never give you credit for being right, Trump Train engineers, because we're still just peon passengers to them, but they'd like to join you now at the cool kids table. Just remember it's YOUR table, patriots. YOU set it. They'd better behave as your guests. The answer is obvious as more dots get connected during this election season's fall out. The shifting and sifting you'll see explains what goes on inside their grimy games. What's left intact are lessons in how to survive, not how to make friends. For me, it's all continued confirmation to never put my hope and faith in the political arena; instead I'll be productive by choosing God and family to give me validation, definition and joy." “What we witnessed on Friday in the Catastrophic Defeat of the Repeal of Obamacare was the fruit and inevitable consequence of the Plan B Shifting and Sifting allowed to occur by Donald Trump as far back as last summer. At least 8 months ago dating to Sarah Palin's “Get Better Not Bitter” warning and probably even further back than that. surround (a place) in order to besiege or blockade it. PALIN: "Exposing political games and connections that hurt the innocent was the early battle. Now we move down the battlefield to hold culprits accountable so they won't be rewarded with opportunity to keep screwing you, America. It's how we win the war for our nation's solvency, sovereignty and security. Conveniently, oppressors of this nationalist revolution found a way to save face. The obvious wall-writing told them they'd lose money and influence if they continued fighting AGAINST the majority, so the donor class scattered from their polarizing candidate when Ted Cruz's suicide vest detonated at the GOP convention. 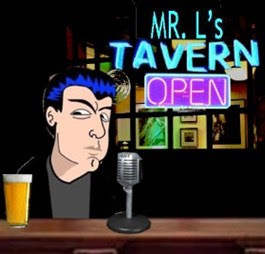 I've been asked all year questions like why it seems I'm “relegated” to outsider status of current political machines; why there's no longer a seat at the talking heads TV table; why'd previous “friends” commence public condemnation of me despite me never changing my values, priorities or loyalties to the right causes. “Crystal ball. The woman has a crystal ball. She sees things very clearly through that crystal ball. So wither is the Presidency of Donald Trump and the fate of our "populist nationalist revolution and Movement-Force-Strategy” tending? Trump is invested and infested. 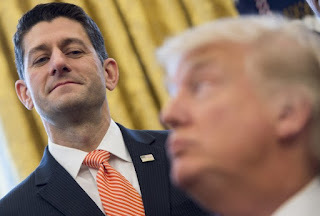 He is surrounded by 5th columnists as manifested in the Leaks and in Ryan's engineered sabotage of Donald Trump's Number One Legislative Priority. He has no link to his base which lies in the latently powerful but Thermopolitically Tepid and Cold American Middle. He has no effective communication or coordination or organizing framework with respect to the Movement-Force-Strategy that pulled off the miraculous improbable Inside Straight for him on November 8. He has cut us and Sarah Palin off. Trump has no OFA. Trump has no lock step union rank and file pounding the pavement. Trump has no BLM shock troops. Trump has no Al Sharpton National Action Network ready to burn down cities like Jefferson Mo or Baltimore or whatever city is going to be burned down this summer (just waiting for a police shooting incident to fire up the Molotov cocktails). Trump has no Party working to secure the agenda. Trump has no George Soros Open Borders New World Order network of seditious organizations working for him. Trump has precious little media support. Trump threw his best most loyal friends overboard to secure what he thought was a truce and alliance with The MONEY and the PPC (Permanent Political Class) and to mollify the critics. He thought he was co-opting the RINOs. Making peace and commons cause with the RINOs. Creating a working "relationship" with RINOs. Recall when Mike Pence announced as Trump’s VP. Karen Tumulty of the Washington Post put it best: "Mike Pence is a signal to the Donor Class. That everything is going to be all right." Ted Cruz' suicide belt made it possible to "shift and sift" to invest and infest and to subvert. To hop on the Trump Train and first destroy Trump's most loyal supporters, throw the original Trump train engineers off the train and take over the engine. Trump did not fail to appreciate the risks he was taking by allowing this to happen. He embraced it. He thought he could control it. He calculated wrongly. He mis-gauged the correlation of forces needed to secure his agenda. He threw Sarah Palin and her Movement under the bus. He bought the Trojan Horse.... complete with an army of 5th Columnists consultants and professional politicos as Sarah Palin calls them.... and personally dragged it inside the gates of his Campaign, Transition and Administration. The Lilliputian alligators and other various swamp dwellers now have him tied down like a fly in their spider's web. Paul Ryan. His biggest mistake. Dragging Paul Ryan into his camp may go down in history as Trump's biggest mistake. IMO, Trump has one chance to salvage his early crumbling Administration. He has GOT to pivot to the Movement-Force-Strategy. He has to organize them. He has to restore a now vastly eroded sense of trust and credibility with the very people who looked to him to advance their agenda. He has got to stop playing footsies with the very Ruling Elite Permanent Political Class inside the Beltway bought off agents of the Ruling Elite that we hold in such contempt. You can't serve the Movement-Force-Strategy and the MONEY at the same time. He has got to recruit Sarah Palin to provide the sorely missing leadership function from outside the GOP political structure. That structure now has him checked. If he continues down his current catastrophic path relying on RINOs to secure his agenda they and the Ruling Elite will soon have him check mate... thanks for playing. Nice quick game. He has to organize the Populist Nationalist Make America Great Again latent political energy and raw political power that now has found other things to do since the moment it left the ballot box last November. "We done our part." He needs his own OFA. He needs his own Soros. He needs his own Al Sharpton. He needs his own army of union picketeers. He needs his own mobilized Movement-Force-Stategy in the streets and agitating for the change it voted for. He needs an engaged, active and launched Sarah Palin, the greatest retail politician in modern political history, directing the Leadership function of this powerful but now sidelined and increasingly demoralized army. There isn't another Sarah Palin out there. She is singular. A singular unique talent. The talent to communicate with and for Middle America. The talent to bring 'em along. To lead by virtue of the courage and consistency exhibited over the past 8 years. Street cred. Vision. Crystal ball even. The credibility that allows hesitant and now thoroughly suspicious Middle Americans to "trust us" and "let's give this a chance". The very reason why so many of us gave Trump the chance in the first place. 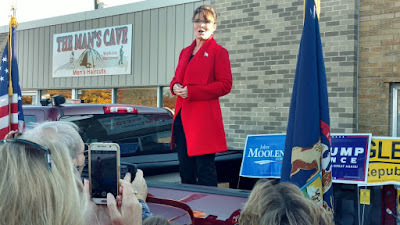 Sarah Palin is the talent that Donald Trump needs to break the grip of the Permanent Political Class that now has a stranglehold on his Administration. There is nobody else out there. Nobody. If there is please show me. He can't do it alone. He needs us now. There's only one person who can "get us". Because she gets us.